The 2011 Pro Tour Championship Title Fight this Saturday!! Home » The 2011 Pro Tour Championship Title Fight this Saturday!! 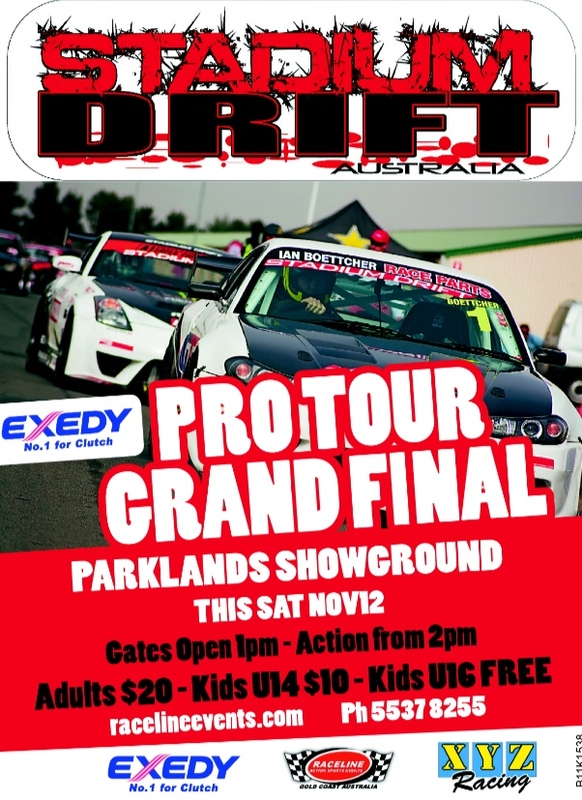 This Saturday is the last round of the Stadium Drift Pro Tour Championship! I’ll leave it to the following press release from Raceline Events to get you hyped for the event! After 8 rounds on 5 tracks in 2 states here is what we are looking at; just back from another Formula Drift Asia event can the very inform Josh Boettcher (GT Radials s15) make it back to back titles, its never been done. Can Kenneally (Hogstar Rockstar Nissan ute) handle this kind of pressure & maybe take the Championship?? Coulson or Rosenblatt (Skylines) or “Huge Euge” in his final drive for team owner Gary Snow (Tokage Soarer)can take a win & upset the lot of them ??? Tas no 1 “MAD ANDY” Considine is also due for a win & so is Baffy, Stephen Mountfort is back to form & Rob Whyte wants to “MONSTER” the entire field. This is supposed to be battles but will be more like a war, some egos & reputations may be dented, we will see donuts on doors, who will stand on the top step on Saturday nite with the “BIG” trophy?! !